I did speech therapy as a kid, it didn't take all the way to be honest. At least I can semi pronounce R and Ch sounds now though. A family friend has trouble understanding my (14-year-old) nephew, and has for years brought up the idea that some kids just need to get the part under their tongue snipped by a doctor so they can talk right. That’s an actual thing, had to have that done to myself. Yup. Called tongue tied. It’s when the lingual frenulum develops much shorter than normal. It usually has other symptoms like difficulty breast feeding or swallowing in addition to speech issues. Some kids thought mute have had the surgery and turns out they can speak just fine. I’ve always had a stupidly short frenulum and it never hurt anything except my ability to lick things more than a cm away from my face. I can stick the MIDDLE of my tongue out further than the tip. It’s bizarre. I’ve always worried getting it snipped would mess up my diction, and I do voiceover sometime so I don’t want any of that. now I’m not sure whether that might actually be a valid concern. Unless it’s an actual physical impediment, there’s no real reason to do it. Most cases are severe difficulty eating or inability to speak. Otherwise, if it’s not bothering you then you really don’t need it. I know it’s a thing that *can* happen, it just seems unlikely to be the case with my nephew. Seems like one of those “when all you have is a hammer, you self-diagnose everyone with the same ailment,” or however that saying goes. the family friend is an idiot. unless the frenulum (the tendony bit holding the tongue to the lower jaw) is extremely short, that is entirely unnecessary. going by their being the only one having issues it’s probably a problem on their end, not the nephew’s. When Selkie rules the world, everyone will have to speak like HER. 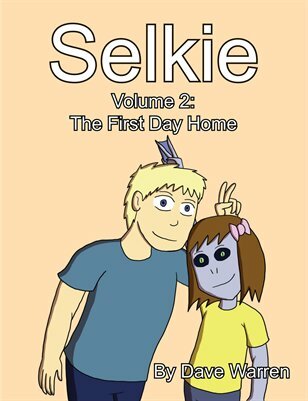 I’m a little shocked that Todd did not have a thorough discussion with Selkie and let her sleep on it, before bringing it up — possibly in fronts of any kids who have comes to schools earlies? Not yer best dadding, there, Todd. Sorry Todd, but “Talk to you real quick before school,” about something that other kids ridicule her for, is not “discussing with.” “Talking to” is another thing entirely, and implies that Selkie’s input is not of import. In my opinion, for instance, “what do you think about our two companies merging?” and “how do you feel about my company buying yours,?” don’t compare with each other. They are two different things. That would be a good approach if Todd was, in fact, open to letting Selkie say no to speech therapy. It sounds like after his conversation with Pohl he has decided that for her own good she’s going to have to try it whether she likes it or not. She’s only eight, going on nine. She has her reasons for wanting to hang on to the esses, and they’re good ones, he does respect them, but they can’t be the only consideration. She is not in a position to appreciate the larger consequences, especially now that Sarnothi are publicly known to exist. As an adult, a parent, he has a duty to think about her future. Fortunately, there are now enough Sarnoti in school with Selkie that setting up a special class for speech therapy would be a good idea. She wouldn’t be the only one having to deal with it. School should have been doing this already. Most public schools I have worked in have had a speech therapist as part of staff. I did speech therapy as a kid as well. Funny thing though, I can’t remember what for. I agree. I have known a number of teachers and/or parents who have needed speech therapy for their kids, and it’s not something the teachers do themselves. It’s a job for a specialist. Same here. I had two years of speech therapy in 1st/2nd grade to help me stop pronouncing my L’s as Y’s. It was after school for about an hour a couple times a week. It worked well for me but it took awhile. I think for me it was also a small office at a nearby school (ours didn’t have a speech therapist). …Did she do more plurals then usual just for the gag? Speech therapy requires a dedicated speech therapist. It takes time and energy to fix speech patterns. I’m also not looking forward to the whole storyline where Selkie proves she’s an echo and turns on her lights, causing Sarnothi Drama. You’d think she would be smart enough (?) to not do that knowing it could put her and her mother in danger. A lot of kids see speech therapists, it’s not a big deal and the classes are usually designed to be fun and games. Well, I guess it’s good that some view speech therapy as okay or not a big deal. 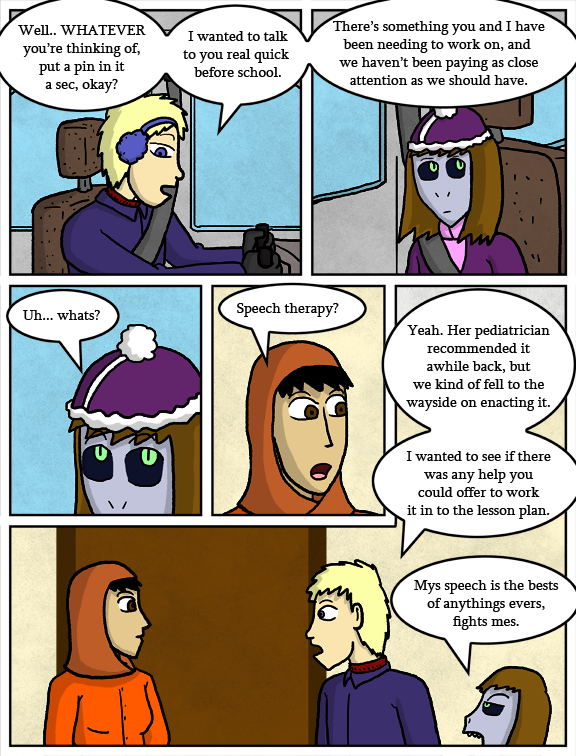 My chest honestly tightened reading this strip; speech therapy led to me researching ways I could injure myself to make myself mute when I was in the 7th grade, and on top of that, it didn’t take. I still get asked where I’m from all the time, with people usually thinking I’m British. Which would probably be an okay thing if it weren’t for all the childhood/adolescent self-loathing wrapped up in it. 7th grade is WAY too late for most people to be getting speech therapy! Speech issues are typical handles in grade 1 to 3, and my own kids only 3 years old and already being assessed for speech development assistance classes and stuff due to slow development. I’d have to say you issues stem not from needing the therapy but the fact everyone that was superposed to take care of you basically ignored the issue till the “they will grow out of it’ mantra stopped working! Needing therapy is not a big deal having Guardians and teaches that don’t care or take the need for it with any amount of responsibility is almost certainly why you suffered! I started speech therapy in 4th grade and continued receiving services until 9th grade. I agree that it’s later than it would normally begin, but please don’t explain to me why I suffered. People have different experiences, and your comment comes across incredibly patronizing.